On Saturday, Holocaust survivor and Nobel Prize-winner Elie Wiesel died. He was 87 years old. Wiesel worked for many years as a professor of humanities at Boston University, and he received many awards for his literary and human rights work. In addition to the Nobel Prize for Peace in 1986, Weisel was awarded the Presidential Medal of Freedom, the U.S. Congressional Gold Medal and the National Humanities Medal, among others. In a statement issued on the day of his passing, President Barack Obama called Weisel a dear friend and praised him for his activism. "At the U.S. Holocaust Memorial Museum that he helped create, you can see his words - "for the dead and the living, we must bear witness," Obama said in the statement. "But Elie did more than just bear witness, he acted. As a writer, a speaker, an activist, and a thinker, he was one of those people who changed the world more as a citizen of the world than those who hold office or traditional positions of power. His life, and the power of his example, urges us to be better." 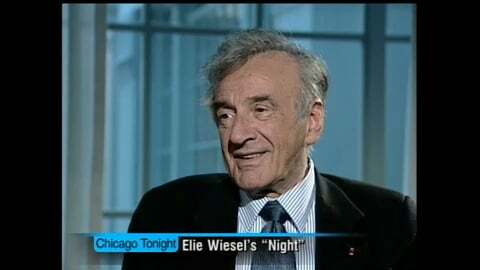 Wiesel was born in an area of Transylvania – now Romania – in 1928. When he was 15 years old, he was sent by the Nazis to Auschwitz, where his mother and sister died. He and his father were later sent to Buchenwald, where his father died. After the war, Weisel went on to study in Paris and worked as a journalist. His experiences as a boy in the Nazi death camps were eventually told in his widely acclaimed memoir "Night." The book was the Chicago Public Library's One Book, One Chicago selection in 2002. It's a book the author and activist doesn't read. Host Phil Ponce sat down with Weisel to discuss the book – and his difficulty writing it – in April of that year. "Night" was first published in Yiddish in 1956. In '58 it was published in French. But in the U.S., Weisel said they couldn't find a publisher. "We have rejection slips from every major publisher," he said. Some said the book was too morbid. Others had questions about the timing of the book's publication and even about the author himself. "Many of them said, 'And we realize that this is a one-book author. This is the only book he will have written.' The same publishers came back later on, trying to woo me," he said. "To give them the other books." Weisel wrote more than 60 books during his lifetime. Writing "Night" was very difficult emotionally, he said. "I had always to fight a doubt: Maybe I am betraying a secret that should not be revealed." "That secret being?" asked Ponce. "Maybe the secret of existence. The frailty of culture. The vulnerability of fate. And my place in all that," Weisel said. "But then, a book without a secret is not a good book." The full 2002 interview is available above, including an introduction by Rich Samuels and a post-interview discussion of the book with then-Library Commissioner Mary Dempsey; and Hazel Rochman, who was an editor at Booklist at the time of recording. July 5: Abner J. Mikva, a former federal judge and congressman, died Monday, July 4 at the age of 90. Mikva dedicated more than a half-century to public service.